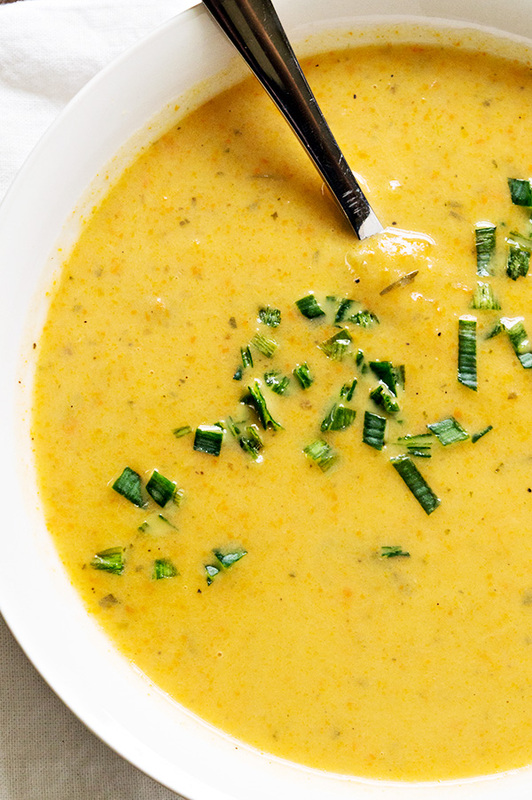 This Creamy Leek and Potato Soup Recipe is easy to make and sure to warm you up during cold weather days. 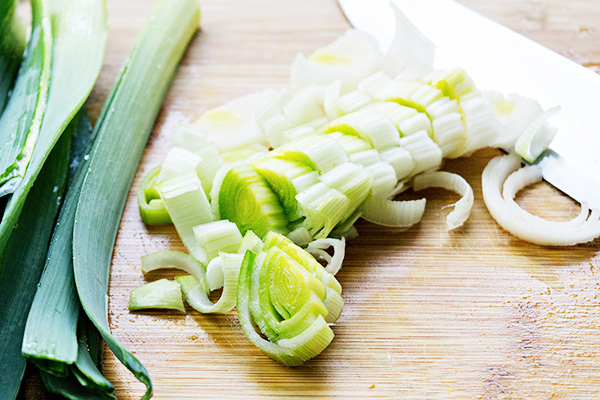 Did you know that leeks are part of the onion family? We’re fans of all sorts of onions around here, but we’re especially big fans of leeks. While they can be a bit of a pain to clean, their sweet and mild flavor makes it so worth it in recipes — especially soups. When you’re looking at a bunch of leeks, it’s the white part and light green parts that you’ll use in my recipes, including this one for this Creamy Leek and Potato Soup recipe. To clean and prepare your leeks for this recipe, cut off the dark green part at the top and trim off the root part, which is at the very end of the white section. Cut the leeks in half lengthwise and then cut into slices. Fill a bowl with cold water and add the sliced leeks to the water, submerging them. Move them around to wash off any of the dirt that might be on them (the dirt should fall to the bottom of the bowl). Scoop the leeks from water and drain. To make this Creamy Leek & Potato Soup recipe, you’ll first cook the washed and sliced leeks and carrots in a bit of olive oil in a pot. The remaining ingredients (except for the heavy cream) are added to the leeks and carrots and cooked until the potatoes are tender. 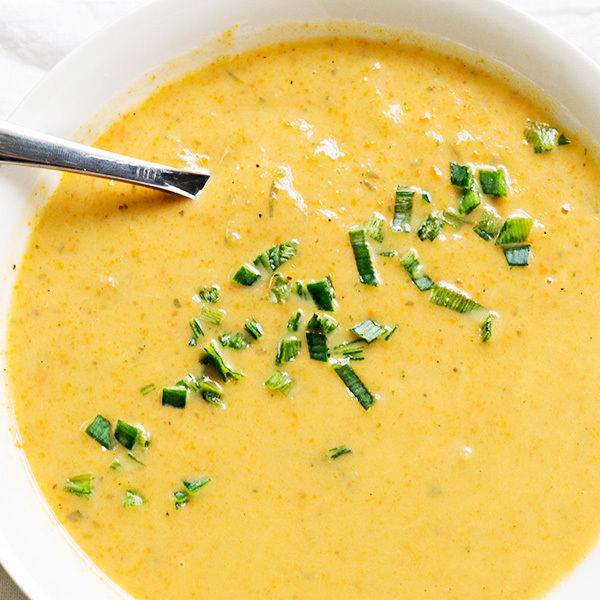 To give this soup a wonderfully smooth and creamy consistency, you’ll use an immersion blender to puree the soup while it is in the pot. 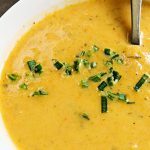 If you don’t have an immersion blender, you can puree these cooled soup in multiple batches in a blender or food processor. It’s not as easy as using the immersion blender, but definitely doable. After pureeing the soup, stir in the heavy cream and the soup is ready to serve and enjoy! Here is the full Creamy Leek and Potato Soup recipe, ready for you to print and make at home in your kitchen. If you aren’t ready to make this soup yet, be sure to save this recipe by pinning on Pinterest or share it on Facebook with your family and friends. Heat olive oil in a large pot over medium-high heat. Add leeks to oil and cook for 4-5 minutes. Add the carrots to the leeks and continue to cook an additional 3-4 minutes. Stir the vegetable stock, potatoes, and seasonings into the leek and carrot mixture. Cook for 20 minutes or until potatoes are tender, stirring occasionally. Remove pot from heat. Allow soup to cool slightly. 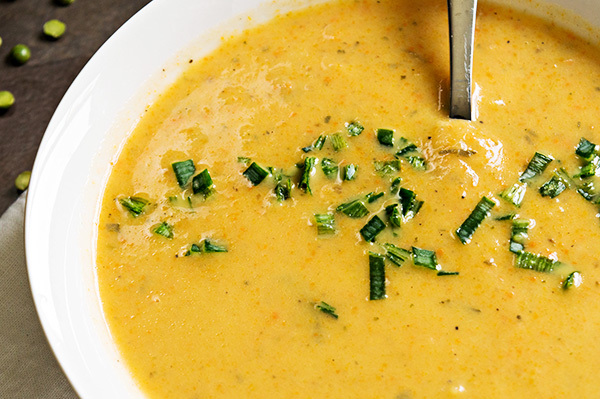 Using an immersion blender, puree the soup until smooth or until desired consistency. Add in cream, mix and serve. –If you don’t have an immersion blender, you can puree the soup in small batches in a blender or food processor. Return soup to pot once it has all been pureed. –Chicken stock can be substituted for vegetable stock, if you prefer. I love this soup and your version. I have not made it yet this winter and just need to get some leeks. Thanks for sharing with Fiesta Friday. 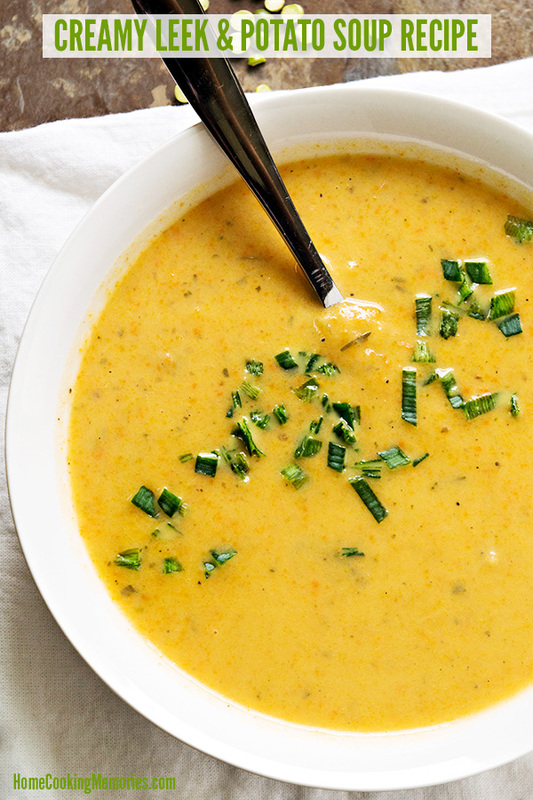 Your Creamy Leek and Potato Soup looks like a pure bowl of comfort, just delicious! Thanks so much for sharing your post with us at Full Plate Thursday. Have a great week and come back soon! 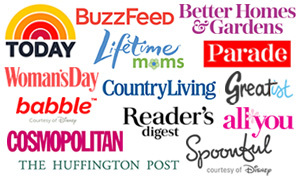 The first time I had creamy leek potato soup was at my daughter’s baby shower. Her sister-in-law brought it. It was delicious!! Your recipe here looks just as good! I am drooling. lol. I usually make a leek pie and this is a nice novelty to me. Thank you for this lovely idea !